MARCH 14 – FOSSILLA PREHISTORY! Giant monsters attack our cities! Where have these strange beasts come from? What can be done to stop their deadly rampage? To save the world, we must….DESTROY ALL KAIJU! 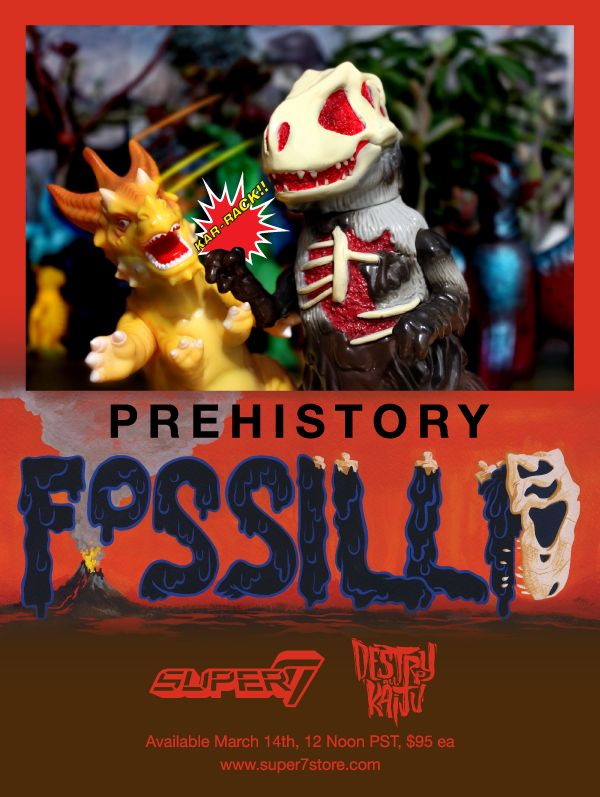 From the annals of time, the terrible creature that said no to extinction, Prehistory Fossilla is here! An ancient asteroid destroyed his world, and he is back with a vengeance! Cast in Volcanic-Ash Grey with black and brown oily-goop spray and blood-red mashed innards under his exposed skeletal remains. This is the first ever painted edition of Joshua Herbolsheimer’s entry into the DESTROY ALL KAIJU! line of standard-sized (approximately 9” tall) vintage-inspired vinyl figures. AVAILABLE NOW! NEW CALIFORNIA DESIGNER T-SHIRTS!